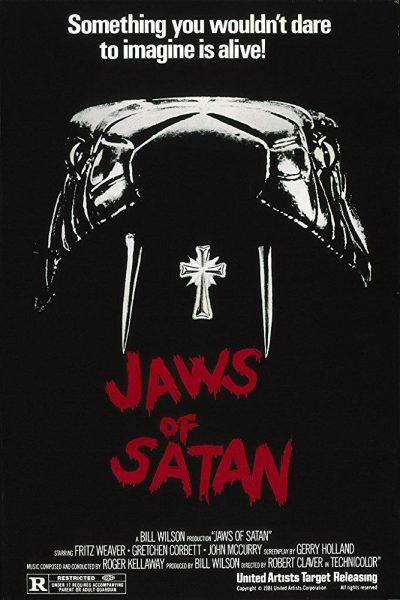 “A herpetologist, a priest and a local doctor fight the devil, who is disguised as a cobra.” Okay, apart from sounding like the opening to a joke, how can you possibly resist a synopsis like that? Memo to self: try harder next time… Although this does show that B-movie fondness for killer snakes goes back way before Anaconda – which begat Python, which begat Boa, which begat Boa vs. Python, etc. etc. It goes in cycles: this was part of the seventies/early eighties loop, which I guess started with 1973’s Sssssss [pauses to count the S’s there]. But this entry seems almost as much influenced by Steven Spielberg’s Jaws, and not just in the title. Well, if the shark had been possessed by Satan and intent on carrying out a centuries-old curse, anyway. This helps stretch the plot to feature-length, along with the subplot lifted from Jaws, which sees Mayor Grady Thorpe (Gordan) desperate to suppress news of the attacks, for fears it would jeopardize the opening of a new dog-track… because Alabama. Allied against him, in the interests of public health, are local doctor Maggie Sheridan (Corbett) and the specialist she flies in to help investigate, Dr. Paul Hendricks (Kork). This puts her on Satan’s herpetological radar and leads to Maggie’s home being invaded by a snake, where it first stalks her in the bathroom. I’m not certain, but I suspect I would notices a five-foot long reptile sharing the shower with me, even if I didn’t have my glasses on. Worse is to follow, because it then crawls up onto the bed where she is air-drying (below). Rather than… oh, I dunno, leaving the frickin’ bed, she opts instead to phone Dr. Hendricks for help. At his hotel. Across town. Fortunately, the snake hangs around while he gathers his equipment, charges out of his hotel, runs to Maggie’s house, breaks in with the aid of a convenient log and pins the snake against the wall. He then, in easily the film’s most disturbing moment, blows its head clean off with a revolver. I’m hoping this was either a really good effect, or it was already dead. The latter is more likely than the former. She then goes all hysterical, and the doctors slap each other. Like you do. The dog-track opening goes ahead, complete with a parade of majorettes and cheer-leaders: because nothing says family fun like gambling on animals. Even though this would also seem like the kind of thing Lucifer should enjoy, the party atmosphere is sadly disrupted by an unexpected snake attack on little Kim Perry (top). Though unlike everyone else, she survives, her life apparently saved by her totes adorbs moppet status. Kim is played, in her feature debut, by a seven-year-old Christina Applegate. Suffice to say, her career could only go uphill from here. Eventually, Father Tom discovers the truth about his past, after a friendly chat with the local Monsignor (Norman Lloyd, who is still alive, and whose career survived this: at the time of writing he is the oldest working actor in Hollywood, at the age of 103). He overcomes a crisis of faith and decides, somewhat inexplicably, that the best way to address the situation, is run out of church, head for the cave where Maggie and Paul are stuck with the king cobra, and run in to it, yelling “SATAN!” Even more inexplicably, this approach actually works, helped by the spontaneous combustion of the cobra when presented with a crucifix. Things this movie teaches us: snakes make effective candles. I guess their spines act as wicks. I do have to say, the snake wrangling is well done, with the actors and reptiles getting more up close and personal then I expected – or, at least, providing a convincing enough facsimile to be effective. It is a fairly rare example of the crossover between the animal and religious sub-genres of horror, popular over the previous decade – Zoltan, Hound of Dracula is about the only other which comes to mind. However, just because you can cross two disparate sub-genres, does not mean you should cross them. This is especially the case when you’re incapable of doing either justice. This was director Claver’s only movie: he was a long-time veteran of TV, and it shows in a style which feels made for 4:3 ratio, taking no advantage of any cinematic benefits. Instead, there’s so much here that makes you go “Eh?”, such as the fondness for looming snake silhouettes which appear whenever there’s about to be an attack. Except when they don’t. The film suffers from a terrible lack of such internal logic, to the point where the main reaction it provokes is a bemused, “Well, that certainly happened” expression. A deliciously loony premise like the one here deserves better, rather than leaving you to pine for the sharp wit of Mega Python vs. Gatoroid.